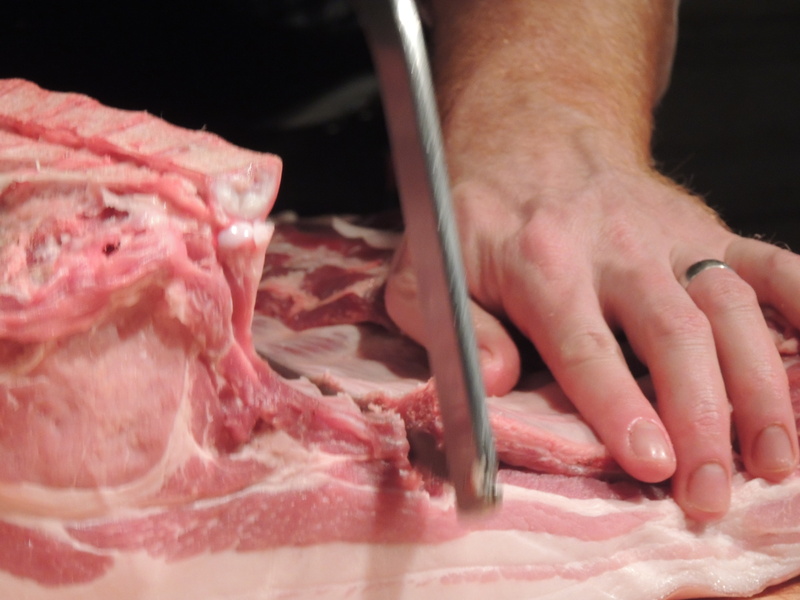 Saugatuck Craft Butchery, located in Westport, CT holds classes in butchery, sausage making and knife skills. Last Thursday I attended a swine butchery class. When I arrived, half a pig was spread across the large wooden butcher’s table, all its parts labeled. The class started with a thorough discussion of sourcing, anatomy and a butchering demonstration. They cleared away the butchered pig and I was a little disappointed. I thought it was more hands on. Next thing I know, two new pig halves came out of the meat locker to the table and there were only seven students – WOW! What an opportunity. Fat surrounding the kidneys is made into leaf lard for pastry making. Next I got to remove the hock from the ham. That’s difficult. The skin is tough and no matter how sharp your knife, you need strength. The butchers make beautiful sweeping cuts, mine were hacks. Getting through that skin is challenging and then finding the joint and separating is problematic – I had to stick my fingers in a few times and feel around to find the joint. I couldn’t see anything until it was completely apart. Once you see how it’s joined together, it makes sense and you can visualize where the knife should go – next time! 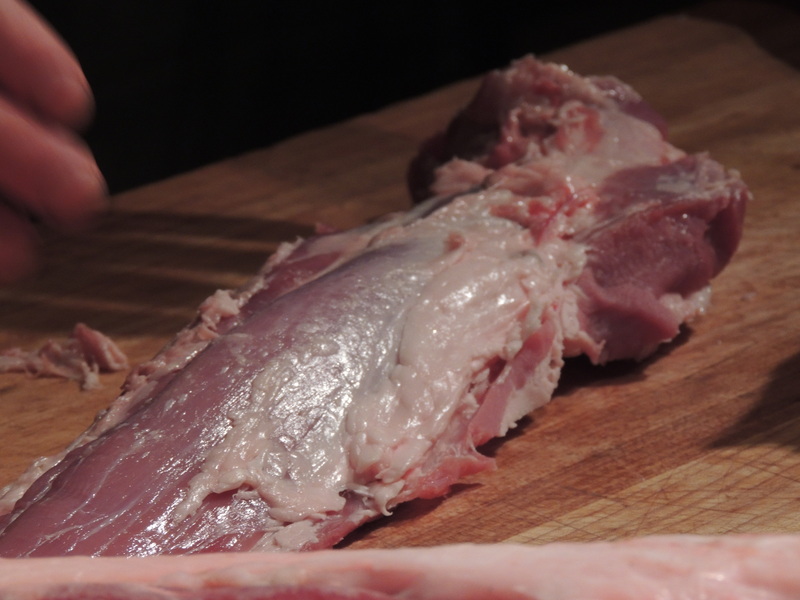 Untrimmed pork tenderloin from the demo. My hands were too slick to take pictures of mine. My last task was to use a hand saw on the rib cage separating the loin chops from the spare ribs. I kept bringing the saw too far back at first. Overall, I think everyone in the group had as much fun as I did and we learned a lot. There’s great finesse to butchering; it’s an art to disassemble an animal and not waste or destroy the flesh in the process. Separating the rib chops from the spareribs with a hand saw. All the excess fat is made into lard. This is also bacon. All scraps go into making a variety of sausages, which we tasted before the class. The kielbasa was my favorite. They make their own bacon and lard as well. 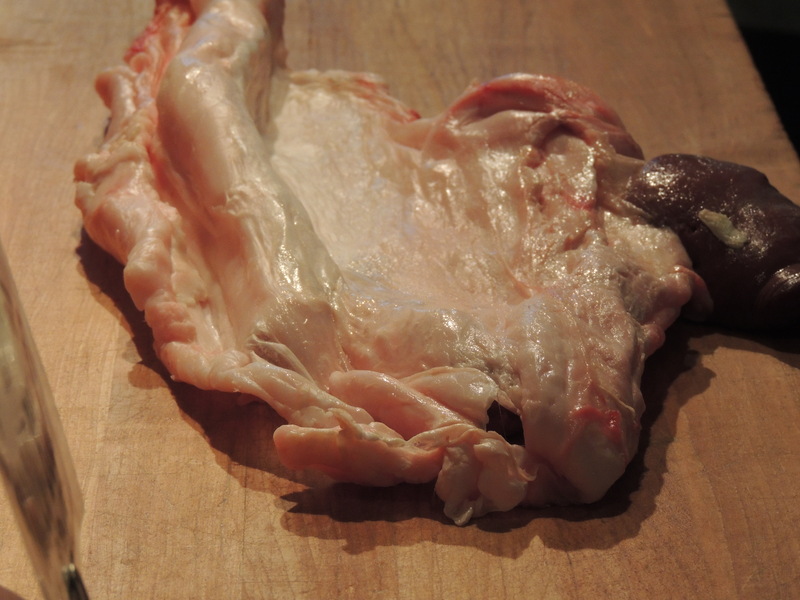 Pig’s ears are turned into dog treats – they don’t waste anything. These guys really like what they do, are friendly and knowledgeable; I look forward to sourcing my meat from them regularly. Good to source meat from the butchers. I like their butchery class, sounds like it taught you a lot. great post! Thanks, it was lots of fun and I learned bunches!